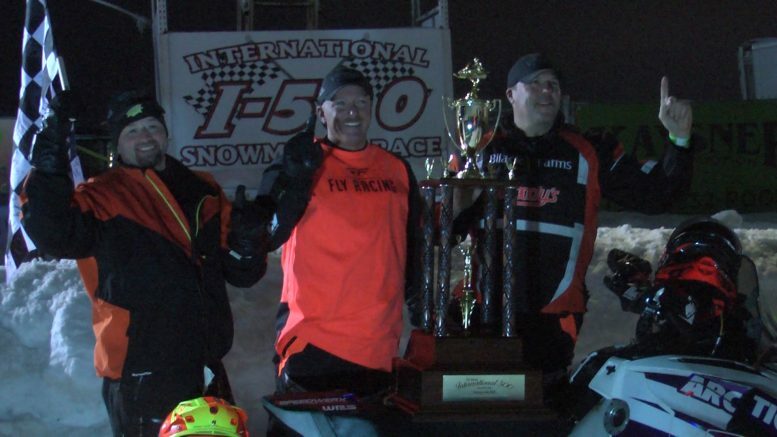 (L to R: Bill Wilkes, Ryan Spencer and Troy DeWald) Cadarette Racing wins their fourth I-500 Snowmobile Race title. Sault Ste. Marie, Mich. — One of the most prestigious, grueling races in the world, the International 500 Snowmobile Race took the track for it’s 51st start in Sault Ste. Marie on Saturday. Three northeast Michigan teams made the trip to race 500 miles, Cadarette Collision Racing #21 from Alpena, Hoos Racing #67 from Alpena, and KMW Racing #7 from Hubbard Lake. The driver to watch was 49-year-old (soon to be 50 on February 7) Troy DeWald from Au Gres. He earned his third consecutive and tenth career pole start. He also won “The Woody’s Challenge,” a 25-lap sprint race on Thursday. Cadarette Collision Racing got off to a fast start, but a few pit stop clutch issues slowed them down, sitting four laps behind at the midway point. DeWald made the winning pass on rookie Quick for the lead with 69 laps to go. Both Alpena teams held on to the top spots and lead lap throughout the rest of the race. 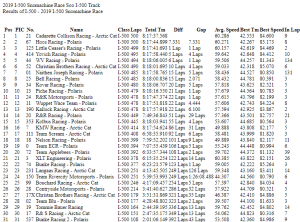 Cadarette Collision Racing overcame the deficit and won their fourth I-500. This victory marked DeWald’s third career win to go with his triumphs in 2010 with Jeff Leuenberger and 2009 with Leuenberger & Bryan Dyrdahl, all with Cadarette Collision Racing. As for Ryan Spencer, the 43-year-old from Flint, MI collected his first career victory. Bill Wilkes, the 50-year-old from Wasilla, AK grabbed his second career trophy to go with his 2007 triumph with Chad Gueco. The winning Arctic Cat snowmobile from Cadarette Collision Racing will be on display at Sports Unlimited on Tuesday, February 5th and Wednesday, Feb. 6th.